Several years ago, I wrote an article about Virginia’s Most Spectacular Hike. While I acknowledge that a superlative description like that is subjective, I still stand by that description these years later. 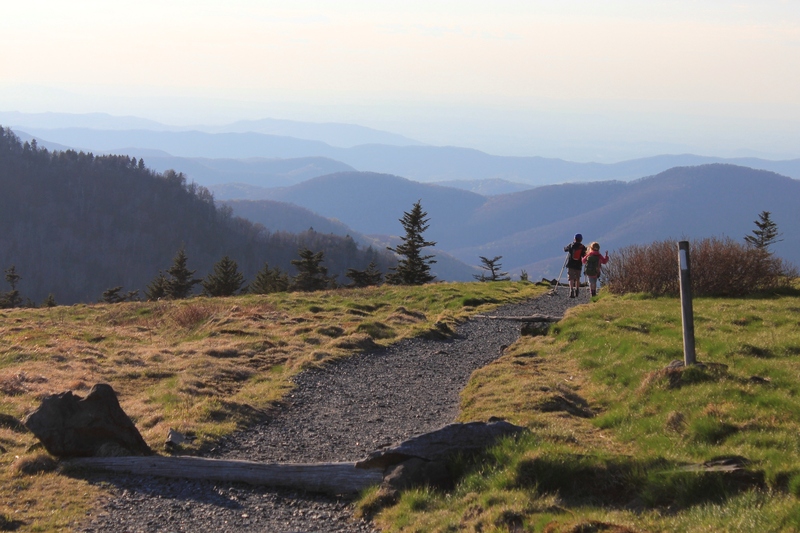 In Tennessee, I believe the most spectacular hike is probably the section of the Appalachian Trail up on the balds near Roan Mountain, sometimes called the “Balds of Roan,” even though the main balds–Round Bald, Jane Bald, and Grassy Bald–are all to the north of Roan Mountain proper. 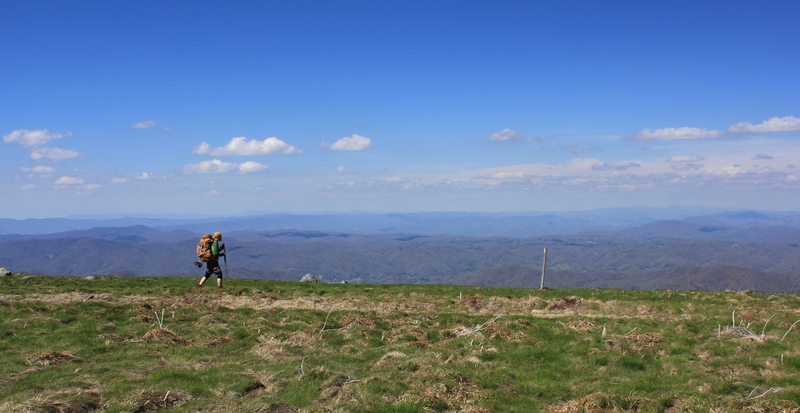 On May 2, 2015, we drove from Abingdon to Carver’s Gap and hiked the AT, which runs across the crest of the first two balds with a short side trail to the top of Grassy Bald. The temperature was around 60° and mostly sunny, with relatively clear skies. The mountains above 4000′ were still mostly devoid of foliage. By late May, the hills will be verdant with hues of green, and by mid-June, the famous rhododendron gardens on Roan Mountain will be in full bloom. This time of year—late April and early May—the AT is full of thru-hikers, those who are attempting to complete the entire AT on the traditional south to north route. 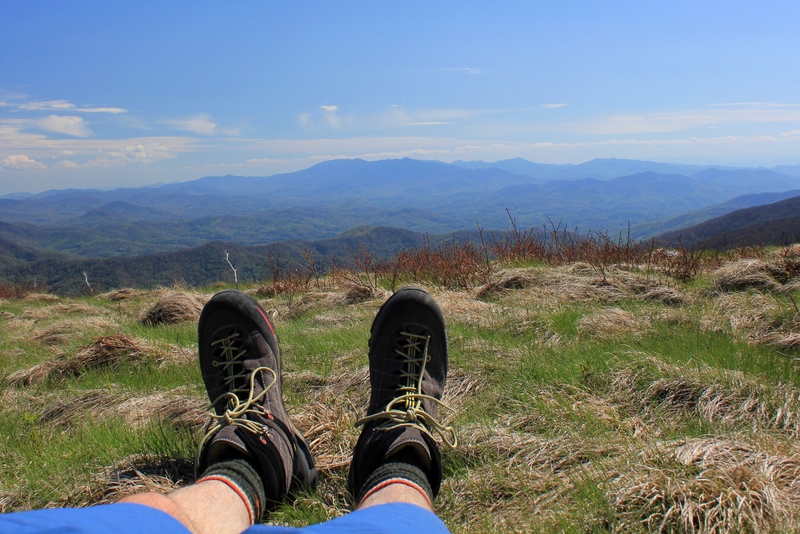 Backpacker on the crest of the AT on Jane Bald, 5820′ above sea level. This view is looking north, back towards Bristol VA/TN and Southwest Virginia. Note the AT marker on the wooden post. If you click and enlarge this photo you can clearly see the white mark on the post. This section of the trail is relatively easily accessed from the Tri-Cities via Route 19 and Tennessee State Highway 143, which climbs to Carver’s Gap at 5512′, where there is a parking area next to the trail. Because of the easy access and great views, this section of the AT is highly traveled and is busy on most nice weekends. 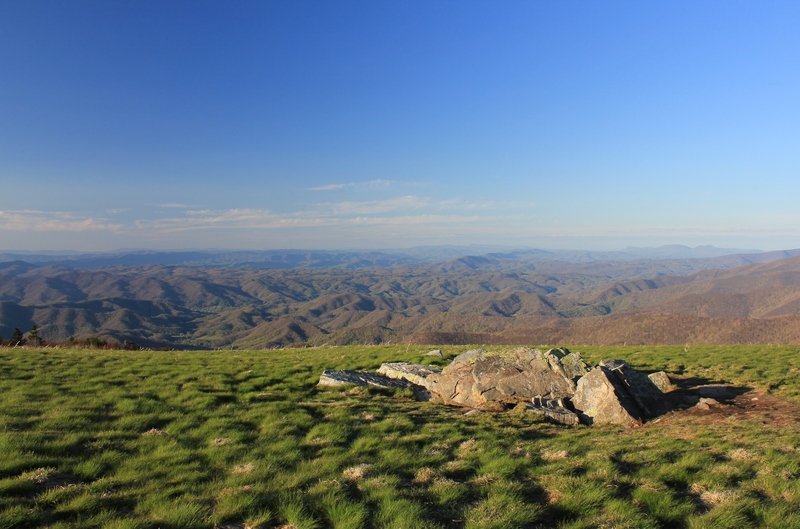 Grassy Ridge Bald is the highest of the balds. It requires a short, moderate climb off a side trail to reach the top. 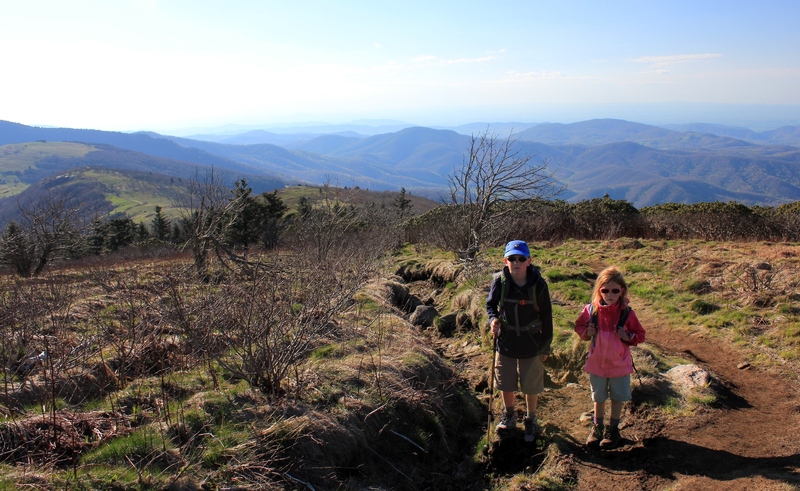 The round-trip hike from Carver’s Gap to the Grassy Bald area and back is approximately 5½ miles. The top of the bald is roughly the size of a couple of football fields, with 360° views depending on where you walk. There were some overnight campers on the mountain the day we were there. The views on a clear night are probably phenomenal, although there is most surely some light pollution from Johnson City and Bristol on the western side. 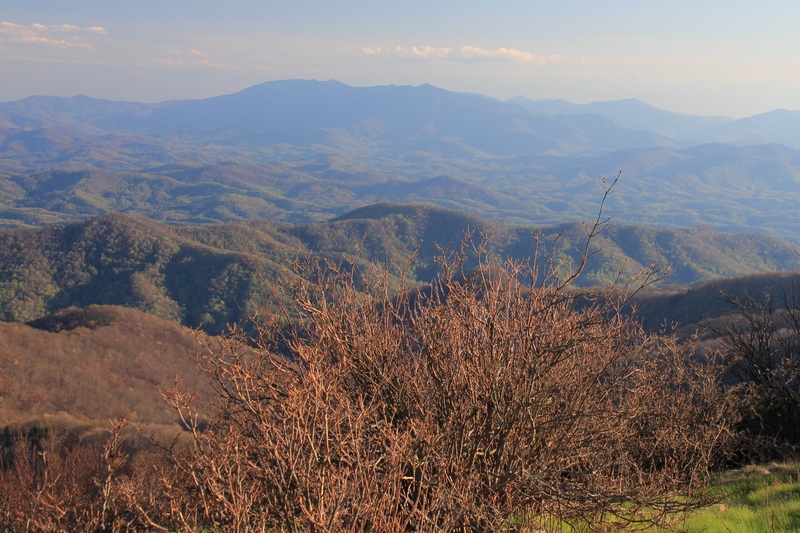 The two above photos show the immense views of the Black Mountains and surrounding peaks in North Carolina. This is one of the best views in the South. On the other hand, the views to the west aren’t too shabby, either. Below is a view looking southwest, where the smaller mountains create layered views that are so appealing and distinctly Appalachian. Looking to the northwest, there are views as far as the Cumberland Mountains in Kentucky. The photo below shows the view more directly north, into Virginia. 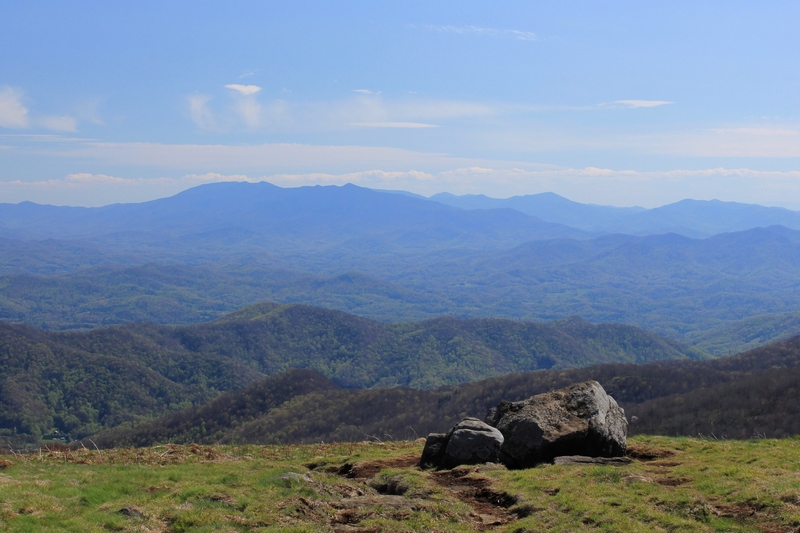 The larger massif on the right side of the photo is Whitetop, Mount Rogers, and possibly Pond Mountain in North Carolina. We were not able to stay until sunset, but came off the mountain just as the so-called Golden Hour was approaching. The shadows grew and the colors softened as sunset approached. This hike is not only accessible by car, but is also moderate in nature. While there is some climbing, the fact that you start at 5500′ means most the climbing has already been done in your vehicle. So the hike is also more accessible to individuals who are fit but not extreme hikers. Because of the accessibility and great views, this hike is one of the most popular in region. If you are here on a weekend, be prepared to have company. Sometimes finding a parking spot is a challenge, too. Those minor considerations notwithstanding, this is a truly spectacular hike that will take you into territory that is unusual for the South. These are the largest contiguous balds in the Appalachian Mountains, and the above-treeline views are extraordinary. Having hiked in the Smokies and most of the other better known spots in Tennessee, it’s my opinion that the balds here make up the most spectacular hike in the Volunteer State. Heading off the mountain. The views don’t let up until the final steps off the trail: What a spectacular hike!